As we've indicated in several other Definitive articles, the 'playhouse' format was a popular staple of Radio Drama throughout the Golden Age of Radio. The 'theatre of the mind' that Radio had become almost from its first dramatic broadcasts, made the notion of live theatre being brought to the living rooms and parlors of post-Depression America both uplifting and entertaining for the exponentially growing Radio audiences of the 1930s and 1940s. Even as other popular genres waxed and waned in popularity throughout the Golden Age of Radio, the 'playhouse drama,' usually showcasing one or two major Film or Stage stars of the era brought fine drama--and fine dramatic performances--to audiences who, for the most part, had never had the opportunity to enjoy such performances on Broadway or the larger, more prestigious drama venues of the era. And indeed, by the mid to late 1930s and early 1940s, the playhouse drama genre became a highly competitive programming vehicle among the three, then four major networks. The 'playhouse format' appears to have been a popular recurring vehicle of choice for both the two major networks--CBS and NBC--and an emerging favorite of both MBS and ABC. And of course it was also a popular advertising vehicle of the era. NBC had been a prolific producer of quality stage play adaptations throughout the Golden Age of Radio. 8:30 p.m.--Hollywood Playhouse (WIBA): new series; James Gleason in "Mulligan the Mighty,"story of New York tailor whose eyes and ears help win Revolutionary war. 8:30 p.m.--Hollywood Playhouse (WIBA): Ann Dvorak as girl who helps brother's buddy to boxing success. 8:30 p.m.--Hollywood Playhouse (WIBA): John Howard in "Hold That Memory," comedy of psychology professor's romance. 9 p.m.--Hollywood Playhouse (WIBA): Cesar Romero in "Luck of Adam," comedy about chain letters. 8:30 p.m.--Hollywood Playhouse (WIBA): Lurene Tuttle in "Goodbye My Love." 8:30 p.m.--Hollywood Playhouse (WIBA): John Howard in "Help Wanted, Murderer." 8:30 p.m.--Hollywood Playhouse (WIBA): Victor Moore in "The Coming of Mr. Snover." 8:30 p.m.--Hollywood Playhouse (WIBA): Meg Randall in "The Truth Pays Off." 8:30 p.m.--Hollywood Playhouse (WIBA): Marjorie Reynolds in "Something Special." 8:30 p.m.--Hollywood Playhouse (WIBA): Robert Hutton in "Sound of Her Voice." 8:30 p.m.--Hollywood Playhouse (WIBA): Eddie Albert in "Little Drops of Water." 8:30 p.m.--Hollywood Playhouse (WIBA): Ann Dvorak in "The Other Side of the Moon." 8:30 p.m.--Hollywood Playhouse (WIBA): Bobby Driscoll in "The Throwback." 8:30 p.m.--Hollywood Playhouse (WIBA): "The Bachelor and the Fox Terrier," with Elliot and Cathy Lewis. 8:30 p.m.--Hollywood Playhouse (WIBA): "The Next Chapter", starring George Brent. 8:30 p.m.--Hollywood Playhouse (WIBA): "Inventory" starring Les Mitchel. 8:30 p.m.--Hollywood Playhouse (WIBA): "Picture These Hands," starring Meg Randall. WIBA 8:30 Who Goes There? 52-10-16 52-10-16 Wisconsin State Journal - 8 p.m.--Hollywood Playhouse (WKOW): John Howard, Denny Shane in "Crystal," drama of marital triangle. 52-10-23 52-10-23 Wisconsin State Journal - 8 p.m.--Hollywood Playhouse (WKOW): Elliott and Cathy Lewis in "For the Good of the Show." 52-10-30 52-10-30 Wisconsin State Journal - 8 p.m.--Hollywood Playhouse (WKOW): Bobby Driscoll in "The Most Unusual Pet in the World"
(8:00 p.m.) Gale Storm in "A Dime a Dozen" on Jergens "Hollywood Playhouse." 52-11-13 52-11-13 Wisconsin State Journal - 8 p.m.--Hollywood Playhouse (WKOW): Adolphe Menjou as editor who works on mystery of vanishing reporters. 52-11-20 52-11-20 Wisconsin State Journal - 8 p.m.--Hollywood Playhouse (WKOW): Rod Cameron as screen cowboy who fights with leading woman. 52-11-27 52-11-27 Mason City Globe-Gazette - (8:00 p.m.) Jergens' "Hollywood Playhouse" presents Margo in "Interlude." 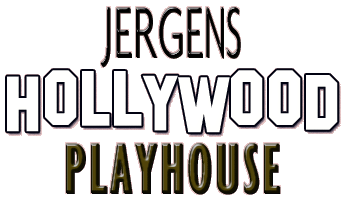 (8:00) Drama filled with excitement and emotion of romance on Jergens' "Hollywood Playhouse of Romance."